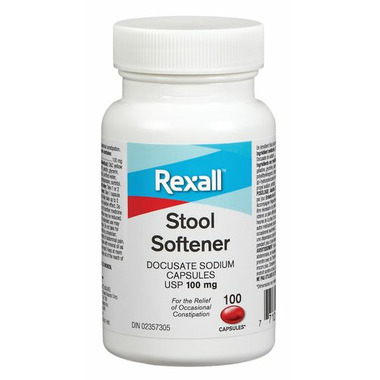 The Rexall Stool Softener Capsules are for the relief of occasional constipation. Made in accordance with the quality standards of the United States Pharmacopeia (USP). Dosage: Adults: take 1 or 2 capsuls daily. Children 6 to 12 years: take 1 capsul daily. Give frequesnt additional fluids. May take up to 3 days medication to fully achieve a laxative effect. Do not take this product within 2 hours of another dedicine as the desired effect of other medicine may be reduced. For occasional use only. Overuse or extended use may cause dependance for bowel function. Do not take more than one week unless directed by a physician.